The Ubud Writers and Readers Festival, held annually in Bali, Indonesia, is Southeast Asia’s largest (and arguably its most well-known) literary festival. This year, the festival featured about 150 writers hailing from more than 25 different countries. 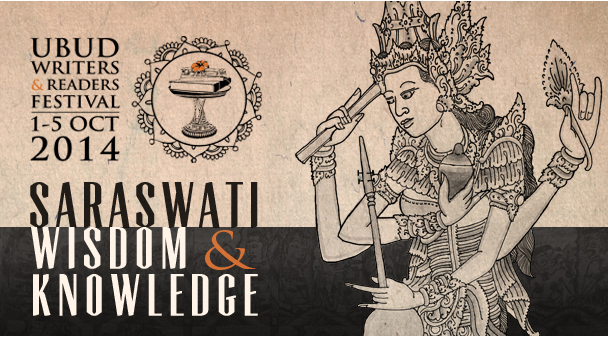 Its eleventh iteration, however, proved an even more festive occasion than usual, overlapping with both Saraswati Day—a holy day in the Balinese Hindu calendar dedicated to Saraswati, the goddess of wisdom and knowledge—and a series of religious ceremonies held at the nearby Gunung Lebah Temple. The sun was hot, spirits were high, and the roads were packed as religious and literary pilgrims crisscrossed the small town of Ubud from morning to evening to attend their respective events. Among the many recurring topics of conversation and debate at the festival was the growing global dominance of the English language. Japanese novelist Minae Mizumura confided her regrets about choosing to write in Japanese rather than English (she was capable of doing both, having spent twenty formative years in the United States), thus forgoing the opportunity to reach the wider audience that writing in English would have afforded her. And yet, despite initial regrets, Mizumura affirmed her commitment to write in Japanese, noting not only that she has had a far greater impact on Japanese literature than she could have ever had on English literature, but also that she regards writing in a non-English language as a sort of personal moral obligation. Asking her audience to imagine a world in which the best and brightest spoke only English—a horrible, pitiful world, she opined—she regarded her writing as an attempt to save us from that awful fate. Indonesian writer Maggie Tiojakin expressed similar concerns at a session on Day 4 about the growing desire to speak in English among the educated, younger generations of Indonesia. “We are losing our language,” she observed sadly (and, both ironically and fittingly: in English). As counter and complement to such statements, several English-language writers spoke of the potential for diversifying English from within. At a panel on the globality of the English language, Chinese-Malaysian writer Tash Aw noted that his multilingual background has influenced how he writes English. As a result, he believes one of his roles as a writer is to stretch the boundaries of English and to embrace its impurities. On the last day of the festival, Amitav Ghosh responded to his interviewer’s description of a passage from his latest novel (heavily spiced with non-English words) as Joycean in comprehensibility by observing that in his experience, language has always been opaque. When he first began to read, many words—“sidewalk,” “daffodil,” “hotdog”—were also unfamiliar to him; but he was able to learn their meaning from context. The beauty of language, he continued, is that it allows you to enter another world. Of course, like so many international literary festivals, UWRF provided a forum for criticizing the tyranny of English, even as it seemed to lend it support. Precisely because almost all of the participating writers—even those writing in other languages—were able to speak and understand English, the festival was conducted in English, with translators provided for the few writers (mostly Indonesian) who required them. The ability of translation to facilitate cross-lingual understanding found expression at several moments throughout the festival. Malaysian writer Chua Guat Eng recounted how the Malay translation of a passage she had originally read in English caused her to weep—a phenomenon that the moderator, Indonesian poet Debra Yatim, described wittily as something being gained in translation, rather than lost. Icelandic writer Sjón expressed his admiration for the particular care taken by the translator of his book From the Mouth of the Whale, and how she drew on the language of older English texts in order to reproduce the feel of the 17th-century Icelandic of his novel. But there were also moments at which writers chose to forgo translation, reading from their work in the original language despite audience members’ unfamiliarity with the tongue in which they spoke. At the book launch for two bilingual anthologies of works by emerging Indonesian writers, readings were conducted overwhelmingly in Indonesian without any English translation. Chinese novelist Can Xue (interviewed here!) read two excerpts from her work in the original Mandarin, despite discouragement from her interviewer, who seemed frustrated by her decision and suggested that a second reading might not be necessary since, he observed, nobody in the audience spoke Chinese. But Can Xue was in good company: Minae Mizumura spoke of the “irreducible materiality” of Japanese and Indonesian poet Bunyamin Fasya read a poem in his regional language, Sundanese, and affirmed its centrality to his creative process. The fact that so many writers desired to read their work in the original languages—and in several cases spoke of the importance of language to their craft—pointed at the lingering sense of inadequacy, the “not quite,” that still haunts translation: the sense that even as translation offers us a window into other worlds, we see through a glass, darkly. Is it possible to acknowledge and celebrate linguistic diversity while using only one language—that same language of global hegemony—to do so? Certainly, UWRF is aware of this challenge, and has already evolved considerably from its format once upon a time, in which Indonesian writers were often hived off in separate sessions—a less-than-ideal arrangement that one regular attendee said created a sense that two festivals were ongoing, an international one and a local “fringe” one. UWRF’s continual evolution can only be a positive thing, and it may be that with literary festivals, as with literary translation, strategies to overcome and respect linguistic boundaries may improve with experience and diligence, even as the product is always characterized by room for improvement. And Indonesian poetry from our journal, including a recording in the original language!